Parts bag contains all necessary nuts, bolts, zip-ties, etc. All states require DOT tires, some states have additional requirements such as Speedo/Odo, mirrors, etc. Please check state requirements. 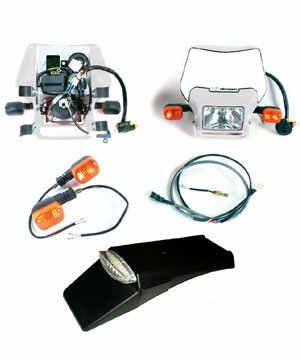 All-new 2005 switch assembly features a modern style pusho-to-cancel turn signal button and an integrated LED high beam indicator. It now unplugs from the front wiring harness with a quick release connector eliminating the need to unplug any individual components to remove the switch. 2009-2010 KTM 150 SX, Fitment Notes: Must have K2 or K3 ignition installed. 2007-2008 KTM 144 SX, Fitment Notes: Must have K2 or K3 ignition installed. 2006-2013 Kawasaki KX450F, Fitment Notes: Requires aftermarket stator assembly. 2006-2010 KTM 300 XC-W, Fitment Notes: Must have K2 or K3 ignition installed. 2006-2010 KTM 300 XC, Fitment Notes: Must have K2 or K3 ignition installed. 2006-2010 KTM 250 XCF-W, Fitment Notes: Must have K2 or K3 ignition installed. 2006-2010 KTM 250 XC-W, Fitment Notes: Must have K2 or K3 ignition installed. 2006-2010 KTM 200 XC-W, Fitment Notes: Must have K2 or K3 ignition installed.